This powerful yet soothing organic face serum is the perfect natural skin care product for those with sensitive skin. Using the natural cleansing power of arnica skin is removed of any impurities present while circulation is also boosted. Combined with the toning and tightening effect of the Ivy and Horse Chestnut plants, pores appear smaller and significantly reduced. As well as naturally purgative, the Calm Skin Arnica Booster Serum calms and hydrates skin with a natural Biocomplex™ filled with vitamins and antioxidants. 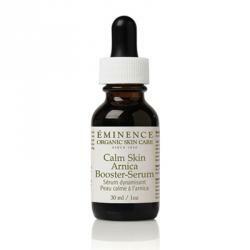 Pick this organic face serum from Éminence for a complete and sensitive solution for natural skin care.